Located in the Hoan Kiem district of Hanoi, the Vietnam National Museum of History forms part of the Vietnam National Museum. With an extensive collection of over 200,000 objects, including numerous precious artifacts and antiquities, it traces the history of Vietnam from prehistoric times to the present. The museum is housed in an architecturally impressive building built in 1925, which incorporates both Vietnamese and French design elements. Exhibits are organized in chronological order. Highlights include bronze pieces from the Dong Son period, Bat Trang pottery, Vietnamese imperial jewelry, and Hindu statues from the Khmer and Champa kingdoms. There’s also a delightful garden with steles and bonsai trees. A number of sightseeing tours feature a stop at the Vietnam National Museum, along with other top attractions like Hoan Kiem Lake and the Ho Chi Minh Mausoleum Complex. Or experience Hanoi like a local on a motorbike tour. The museum is a must-visit for those with an interest in Vietnamese history. The admission also covers entry to the Vietnam Museum of the Revolution, across the street. There’s an extra fee to take photos or videos inside the museum. Guided tours are available in Vietnamese, English, and French. 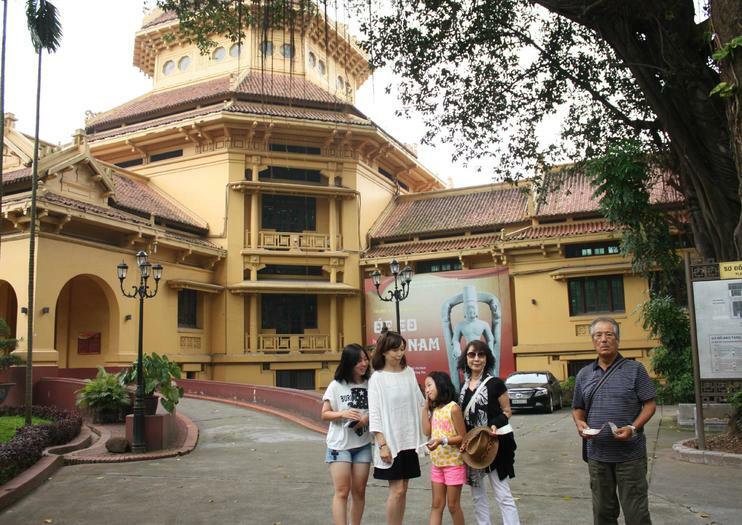 The museum is located in the Hoan Kiem district of Hanoi, close to the Opera House. It can be reached by walking from the Old Quarter, or an easy taxi ride from elsewhere. It can also be reached by bus, including buses 2, 3, and 4. The museum is open every day, except the first Monday of each month. There is a break for lunch, so plan your visit accordingly. Expect to spend 1-2 hours here. Allot more time if you plan to visit the Vietnam Museum of the Revolution as well. The Vietnam National Museum of History was formerly home to the Louis Finot Museum of the École Française d'Extrême-Orient, built in 1929 and opened in 1932. The building was designed as a work of art and features Indochine architecture, a blend of French and Vietnamese styles. In 1958, the Vietnamese government took over the building and reopened it as the Vietnam National Museum of History. Take in some of Hanoi’s top monuments and traditional Vietnamese culture during this 12-hour private sightseeing trip. Explore famous Hanoi attractions like Ho Chi Minh’s Mausoleum, Hoan Kiem Lake, and much more. You’ll also get to mingle with locals in the city’s Old Quarter and enjoy a traditional water puppet show performance. Lunch, admission fees and transport are all included.